Antoine, a 16 years old french student doing game dev in his spare time when he's not procrastinating. 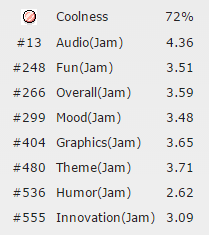 Fell in love with game jams since LD32. Uses GameMaker: Studio, PyxelEdit and Chiptone. C_NFINEMENT R__M, our little game thing! Despite our team not being that inspired by the theme, we managed to make a little thing. Sorry for yet another post on the matter. It seems the comments that I’ve given aren’t appearing under the corresponding section. Is it a bug? or is there a quirk I’m not aware of? EDIT: Nevermind, I made a fool out of myself asking for something that was already here and that I was not aware of. But on a side note, it seems the comments that I’ve given aren’t appearing under the corresponding section, might there be something I’m doing wrong or that i’m not aware of? I know it might not be a wise idea to expand the Feedback Friends site knowing that the new site is coming, but a nice feature would be to have a way to know how many games we have commented so far. And a bit like the old ratings display of the previous LDs, it would also be cool to see which games we have commented on, in order to keep track of our most/least favorites and this kind of thing. I didn’t want to make a post just for that but I couldn’t find a place dedicated to that. Hurray, we succeeded on submitting before the deadline. It was tight but we managed to make something rather cool, it’s a little die-and-retry puzzle platformer and if you like difficulty, this might be your cup of difficul-tea. You can play it HERE. Expect a postmortem post soon-ish this week. No gameplay gif yet but you can have a sneak peek at our titlescreen. No name has been found as of now, so all hail the temporary title sprite. Took us a lot of time to find a not-too-fancy idea, here’s our progress so far. Petit clin d’oeil à tous les participants français! Faites-moi signe si vous êtes de la partie! This will be my 5th consecutive time entering Ludum Dare yet this is the 1st time I’ve made an “I’m in” post. So get pumped for you shall witness my boringly ordinary weapons of choice. I wish you all a great jam! Everything’s in the title, feel free to check it out if you haven’t had the opportunity to do so. There’s also a posmortem about it if you’ve got an additionnal couple of minutes to spare. Howdy fellow jammers, it’s postmortem time! If you haven’t played our entry, feel free to give it a try HERE. Let’s recap the hell out of this! Before settling on an idea with Dave, my teammate, I had been working on a « just-in-case » shoot ’em up game called Chicken Fuel at the time, here’s what it looked like when it was left very early into the jam. Then came the idea of a molecule-based game. We didn’t yet know what to do but the take on the theme was inspiring to the both of us and so we brainstormed from there. That’s when the idea of a « Moleculevania » came up, we threw a couple of possible mechanics for it on a paper and that was the idea that sounded the most feasible in the remaining time. It doesn’t sound like it, but this process took us the whole first 24 hours. We wished we could go far enough to make a little boss battle based on radioactive elements such as Plutonium or Uranium but that sadly didn’t happen. So now, we had a couple of transformations with a feature each and we needed to head onto the metroidvania part of the game, that is to say the level design. I wanted to allow for some exploration without too much struggle for the non-fans of this style of gameplay. The sketch below was the first draft of the general idea for the level layout, from there improvisation took the lead. One of my personnal goal was also to make something very minimalistic, that’s why I tried to put as few texts and as few graphical details as possible. I also tried to make a very simple but effective GUI, the display of the number of electrons and keys collected was rather straigt forward but it took me some time to figure out a way to tell the player how the transformation system worked without any text output. This Ludum Dare was an experience for me for some parts of the programming. Indeed, this time I messed with something new to me which is surfaces (and occasionnaly blend modes). Their use was necessary for the implementation of the lighting system. Overall, I’m really proud of this entry. Despite the level design I wish I had taken more time to fiddle around with, I think the game came out as a tiny little polished experience package ready to nom a handful of minutes from the players’ life. I expected the game to be less welcome than my previous entries because of the huge difference of genre, going from intense arcade games to a very mood exploration one, but the reactions went against my expectations and I was positively surprised how it was welcomed. That’s about it, thanks for reading through this little beast of a postmortem, I hope you enjoyed it. Thanks everyone for all the great comments and feedbacks on the game so far! While I’m at work on cooking up a postmortem post for you to feast upon, you can check out and rate Aether Crypt if you haven’t already. If you’re fond of ambient stuff, a big fan of metroivania style games, a platformer addict or a chemistry nerd, you might enjoy giving it a try. Here’s a couple of screenshots to give you a taste of what you’re in for. And it’s waiting for your feedbacks! You can plat it here Here! What time is it? It’s postmortem time! Audio: Really proud of how the audio fit the style of the game. Again, credit goes to the great Ted Wennerström. Programming: Programming went rather smoothly, I’m pretty happy of the way the game is built, it allowed a lot of changes in the same canvas. Balance and Design: Oh did I screw up that part. A majority of players made me notice how the game should be more penalizing. I first thought of letting mistakes pass in case people were not good at this kind of game and the Accuracy rating was just a treaky way to reward the accurate player, but it runed out pretty bad. Secondly, the game was way too fast since the beginning but while playtesting got me used to the speed and I realised too late that indeed it was way too difficult. Ideas: We knew in the very beginning what the style of the game would be but had no idea on the precise mechanics so we groped until we stuck to the arrow mechanics. Theme: The tied themes were pretty confusing at first, moreover we started the design around Growing but ended up using the Two Button Controls because I couldn’t get the Growing mechanics to be fun to play. Kicking it with the Audio score. Did better with Theme than I thought. Fun and Mood were the main focus I guess, and I’m actually a little surprised about the Fun score considering the huge penalty flaw of the game. Thanks everyone for playing Dizzy Dazzle, cheers! Dizzy Dazzle is finally out! Our entry Dizzy Dazzle is finally out. If you like games or if you like music, you’re gonna love this game, otherwise you’re gonna love this game. Feel free to give it a shot, feedbacks are super appreciated! I still don’t know where I’m going with that, but here it is. Can you figure out the 2 buttons control?